The following students are each winners of a Greg Tang book! Coming up next: Greg Tang's March MATHness Challenge & Greg Tang's Spring Break Challenge, details coming in March. 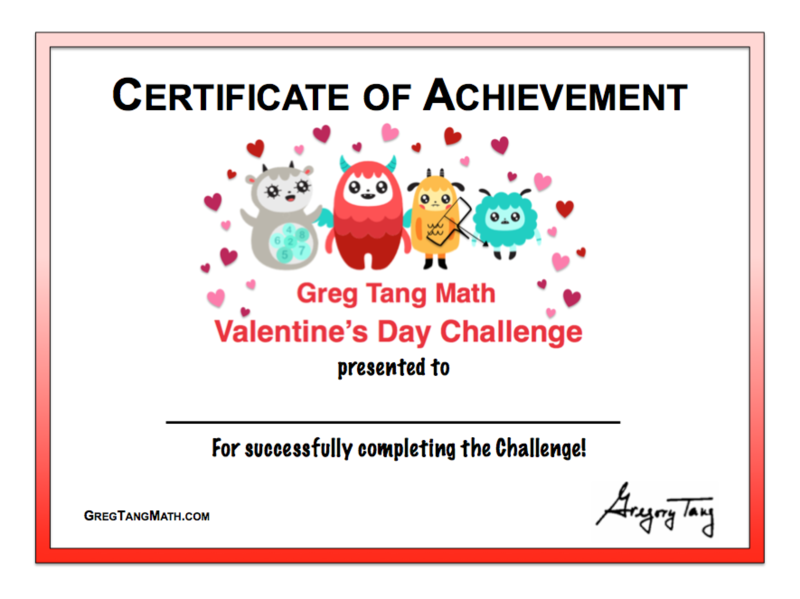 A math challenge game board for students to complete around Valentine's Day, using the online games and books at GregTangMath.com. Students will win prizes from Greg Tang Math. Click here to enter! Starting February 11th, ending February 18th, 2019. Students learn and practice math skills around Valentine's Day! Game boards with no grade level listed (0=Kindergarten, 1=First Grade, etc.). ✔ Give each child a game board around Valentine's Day. ✔ Remind the students to return their completed game board to their teacher by February 19th, 2019. ✔ Fill out the online entry form by February 21st, 2019 to be eligible for the prize drawing! ✔ Return their completed game board by February 19th, 2019.